Healthy eating is not about strict nutrition philosophies, staying unrealistically thin, or depriving yourself of the foods you love. Rather, it’s about feeling great, having more energy, stabilizing your mood, and keeping yourself as healthy as possible—all of which can be achieved by learning some nutrition basics and using them in a way that works for you. You can expand your range of healthy food choices and learn how to plan ahead to create and maintain a tasty, healthy diet. Unable to attend RebelWell’s nutrition events, talks and demonstrations? 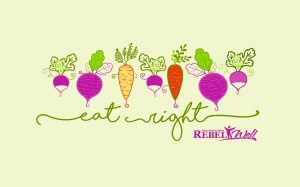 Whenever possible, RebelWell records nutrition talks and demos to share online. A library of nutrition talks may be found here.